San Francisco - The Electronic Frontier Foundation (EFF) today presented a federal court with a detailed explanation of how the NSA taps into the Internet backbone and requested the judge rule that the agency is violating the Fourth Amendment by copying and searching the collected data. EFF argues there are now enough agreed-upon facts in our lawsuit, Jewel v. NSA, to reach a constitutional conclusion. 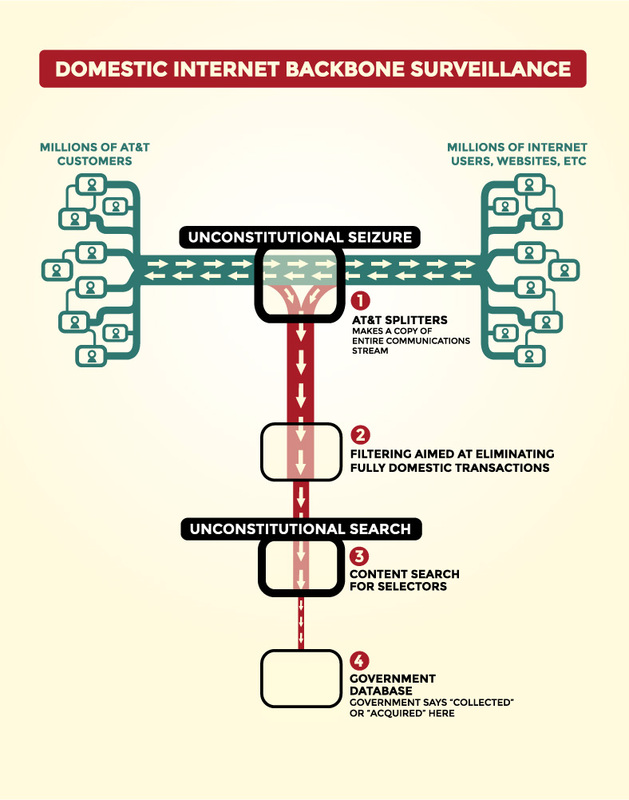 To shed light on how the mass surveillance violates the Fourth Amendment, EFF crafted a new infographic that details each stage of the surveillance. The graphic is freely available for republication. "We believe there is enough on the record now for the judge to rule that both the initial mass seizure and the subsequent searching of the content of Internet communications are unconstitutional," EFF Legal Director Cindy Cohn said. "By installing fiber-optic splitters on the Internet backbone, and then searching through tens of millions of Internet communications it collects, the NSA is conducting suspicionless and indiscriminate mass surveillance that is like the abusive 'general warrants' that led the nation's founders to enact the Fourth Amendment." Jewel v. NSA was filed in 2008 on behalf of San Francisco Bay Area resident Carolyn Jewel and other AT&T customers. EFF has amassed a mountain of evidence to support the case, including documents provided by former AT&T telecommunications technician Mark Klein showing that the company has routed copies of Internet traffic to a secret room in San Francisco controlled by the NSA. Telecommunications specialist and former FCC technical adviser J. Scott Marcus also has given expert testimony confirming the mass, domestic nature of the collection. Other whistleblowers—including Thomas Drake, Bill Binney and Edward Snowden—have revealed more detail about how this technique works and feeds data into the NSA's massive collection of communications. Over the last year, the government has confirmed that it searches the content of much of what it collects as part of its "upstream" activities without a warrant. Instead, it currently claims the searches are justified under Section 702 of the FISA Amendments Act. "By sitting on the Internet 'backbone' at key junctures, the government is operating a digital dragnet—a technological surveillance system that makes it impossible for ordinary Americans not suspected of any wrongdoing to engage in a fully private online conversation, to privately read online, or to privately access any online service," Cohn said. "The Constitution was written to ensure that Americans felt secure in their papers, digital or otherwise, and we're asking the judge to rule that the NSA's mass seizures and searches are illegal." EFF is also currently fighting with the NSA over its failure to preserve evidence, including years of Internet-backbone data it collected, as well as telephone records and Internet metadata. Jewel v. NSA is one of three of EFF's cases aimed at ending NSA spying. The two others are First Unitarian Church of Los Angeles v. NSA and Smith v. NSA. Note on Graphic: The graphic is available under the Creative Commons Attribution License. Attribute to Electronic Frontier Foundation/Hugh D'Andrade.